Although this rug is very thin, it still works really well in my living room. You will need a pad underneath it but other than that it is absolutely beautiful! 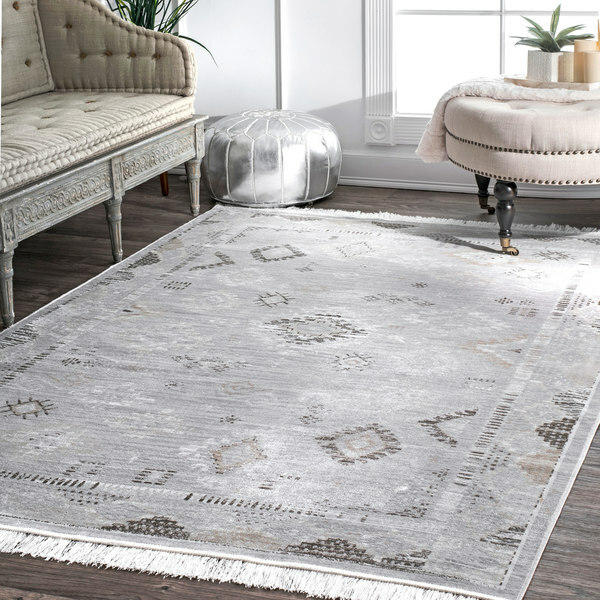 Sink your toes into the luxurious softness of this vintage rug with faded diamond patches and silver tassels. This attractive, traditional rug is shed resistant and great for areas with high foot traffic. Like other reviews indicated, this rug is unusually thin. Had we not been laying ours over carpet, we would 100% need a rug slip under it or may have even considered returning. But works great for us! The pattern is beautiful & the rug is SO soft. In-person, the rug is DEFINITELY more silver/ice vs a grey. Option: Silver - 7' 6" x 9' 6"
It is a great rug for the price. Really like the color and it is very much as shown on the website photo. The only drawback is how thin it is, so definitely needs a pad. This rug came MUCH lighter than the pictures showed. It was a shiny silver/ivory in most areas. There is hardly any dark greys. It is not well suited for high traffic areas. Very great rug, very soft. Very nice!! Thin rug but super soft....looks great under table in dining room. I recieved this rug then decided to send it back because it's really thin. Absolutely beautiful. I ordered for the kitchen but it is too suave. Very thin and silky, silver. Will use it for my closet. Love the feel of the carpet, soft and silky. It is not a thick carpet which is why I bought a pad. Problem solved. However, it is NOT gray at all. It is ivory. I contacted Overstock the same day I received it and and they initiated a full refund with a free shipping label. They said that it was a rarity that the wrong color was sent. Now as soon as I receive the refund I will purchase the gray one. Great customer service. Thanks gave UPDATE: Overstock gave me a full refund after they told me they would send me the correct one. After being so positive about their customer service, I now need to retract it because they did not do what they said they would, even after emails were presented of proof of what they said. 2 stars because I got a refund promptly. Great runner. It is on the thin side and is more white than expected but it’s absolutely perfect in our dark hallway for our little kids to run up and down on! "Is the Fringe white or ivory color?" The fringes on this rug are an ivory color.